I was fortunate to fit in this lovely walk before the weather turned cold with snow and ice. In fact it was a beautiful day, bright and crisp, and so I made the most of it by wandering around one of my favourite locations. I parked in the bottle bank car park at the top of Winster, which is very conveniently situated and free of charge, and set off past the Old Parish Poor House – over a century ago this provided shelter for the homeless – and then continued up the road to the preserved Ore House, where Miners would have deposited their valuable ore to keep it safe overnight. From here my route headed along a stretch of the Old Portway behind the 17th century Miners Standard pub. From this elevated track I could see for miles across distant hills and valleys. There are lots of little stone buildings in this area – sadly many are in a poor state, but they are reminders of a time when some Winster folk were part-time farmers or smallholders and would have kept a cow or two and possibly a pig to fatten up for Christmas. The track is part of a very ancient route, known as The Portway, that ran through the heart of Derbyshire from Derby towards Castleton. This particular stretch, known as Islington Lane, is sheltered by trees and old hedgerows and descends past Grey Tor before crossing over the drive to Westhill Farm. On meeting the road to Elton at the top of Chadwick Hill, my dog, Alfie, and I dropped down Dudwood Lane opposite. Here I saw a sudden movement to my right in a rough and overgrown area and a kestrel took flight, with something small and possibly furry in its talons. I watched amazed as it landed on the branch of a nearby tree and began to devour its dinner, not at all perturbed by my presence. After watching this incredible display we continued down the hill and then headed up the drive to Robin Hood's Stride for some magical camera moments. This rocky outcrop is also known as Mock Beggar's Hall, probably because in the right light its two towering rocks – known as Weasel & Inaccessible – appear like high chimney stacks from a distance. Through the gateway at the top of the hill I could see the small stone circle known as Nine Stones, although there are now only four left standing. The area around Birchover and Stanton Moor abound with stone circles, standing stones and references to Druids – as well as rocks and relics of prehistoric times when early man built primitive settlements and buried their dead on hilltops. As a child I was brought to Cratcliffe Woods to see the hermit's cave and the memory of seeing that little rock shelter for the first time has stayed with me all my life. Every once in a while I come back and walk along the path through the woods to see this little cave, with its carved crucifix and shelf for a candle, which probably dates back to medieval times. It has been suggested by archaeologists that the hermit's cave could in fact date from the 13th century and would have been the home to a holy hermit who guarded over travellers on the old portway, a reward for his prayers of a safe journey being gifts of food. After our little detour Alfie and I wandered back down to the main road that was laid as a turnpike road in 1810. Here we turned left and carefully followed the busy road for a short distance to a stile on the right where a new bit of decking and little gates have been installed to avoid the worst of the mud – this is a boggy bit of path, even in summer! On the opposite side of the road is a two hundred year old milestone, long since made redundant when road atlases and later SatNav's were introduced. Sadly it is badly eroded and not the best example of its kind. We now ascended a slippery bank before turning left along a track that would take us to Birchover. I was just watching two buzzards gracefully soaring over the trees when a plane flew overhead. I could tell from its engines that it was very old and possibly vintage. Suddenly it swooped down in the vicinity of Haddon Hall and began an acrobatic display, emitting a white smoke or vapour trail. It appeared to almost loop the loop, momentarily leaving behind a circle or heart in the sky that it then flew through. This walk was certainly throwing up some unexpected surprises! A very dark and narrow lane runs up into the village, passing on its way the magnificent Vicarage which for a time was home to Brian Clarke the architectural artist who has become a world authority on stained glass. Examples of his work can be found in the little church alongside as well as the wonderful ceiling of Cavendish Arcade at Buxton. Birchover School was built in 1881 but closed in 1984 just a few years after its centenary. Young children in the village now travel to Stanton-in-the Peak for their education. Birchover Reading Room was built in 1907 and underwent repairs and modernisation a few years ago so that it could continue to be used as the Village Hall and meeting room. Alfie and I wandered up the main street to a junction and triangle of grass where I sat on the 'tank' for my picnic lunch. Rather conveniently located by the bus stop and providing somewhere to sit and wait for the Hulley's bus to arrive, this stone storage tank at one time provided the village water supply. After our roadside picnic it was now only a leisurely stroll back to Winster. We headed out of Birchover past the playing fields and to Uppertown where it is thought the village was originally situated. The old building next to the restored stocks was believed to be an inn and contains a built-in cupboard carved with the date AD1571. Fragments of masonry found nearby with ornamental carving are thought to have been part of a Norman church, long since demolished. The old road leading down to Darley Dale through Clough Wood was certainly an early highway along Birchover Edge, but why the village was relocated to its present position is a bit of a mystery. We continued ahead on a particularly narrow road that is unsuitable for many motors. It drops steeply down a deep holloway where grooves in stones alongside are evidence that some motorists got it wrong or may even have got stuck! Now quiet and rarely used, this is a lovely winding route back to Winster, avoiding muddy fields and slippery paths. Returning to Winster we walked along the road past the impressive entrance and sweeping tree lined drive to Oddo House. For two hundred years, this was home to the Brittlebank family. We then wandered through the churchyard of St John the Baptist, featuring a tower dating from 1721, and emerged at the side of the fabulous Dower House, overlooking Winster's main street. Our wonderful walk had not quite finished. It was such a beautiful day, and the light was so perfect for pictures, that before I returned to my car I decided to wander around Winster, admiring the hotchpotch of higgledy-piggledy houses tucked away down alleys and 'yards' connected by narrow winding paths and ginnels. Built mainly on the profits of lead mining, Winster is packed with quaint cottages and character houses, with over 70 being of such importance that they are now listed buildings. This includes the Winster Market House (pictured left), believed to be constructed during the 16th century, and now owned by the National Trust. 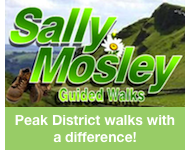 Sally Mosley is passionate about the Peak District and likes to pass on her vast local knowledge through guided walks, talks and writing. She has written a regular fortnightly feature for the Peak Advertiser for more than 24 years and is the walks feature writer for Derbyshire Life & Countryside magazine. Her business has been awarded the Environmental Quality Mark accreditation in recognition of her high environmental quality standards in the Peak District National Park and her caring and fun approach to promoting it! The village community steadfastly continues to celebrate and enjoy local customs and traditions. One of these is the annual Winster Pancake Races – held on Shrove Tuesday in February – which sees the main street closed to traffic to allow the time-honoured tradition of pancake racing to take place in safety!